The Bunburyist: Clues 35.2 published: Bentley, Charteris, Christie, Hammett, Melville, et al. This article examines the close relationship between author and character in the fiction of Leslie Charteris. Charteris created his thriller hero, Simon Templar or “the Saint,” as an image of what he was and what he would like to have been. Templar’s activities, attitudes, and multifaceted nature strongly reflect the life, experience, and emotions of his creator. Through examining the ways in which three of Agatha Christie’s novels expose the imperial underpinnings of the English village, invert ideas regarding miscegenous relationships and spotlight the decline of the English ancestral estate, this article reassesses Christie’s articulation of English national identity, arguing that her relationship with established notions of Englishness is more ambivalent than is often recognized. Drawing on Barry McCrea’s work on Arthur Conan Doyle, this article challenges claims that the interwar country-house mystery arose from reactionary nostalgia for a “dead” institution. Responding not to a sudden death but to a slow decline, the form in fact facilitated the country house’s reconfiguration as a biologically sterile but narratively generative queer space. 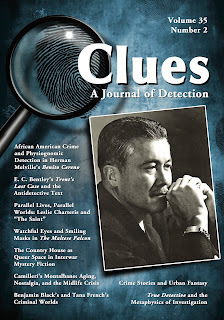 Placing Herman Melville’s historical novel Benito Cereno (1855) in the context of the antebellum north, this essay explores its representation of criminal detection. Melville’s novella mainly relates the thoughts and perceptions of American sea captain Amasa Delano who, suspecting some sort of plot or treachery aboard a strange ship, employs a method of detection that evokes physiognomic theories developed near the time of the story’s setting in the late-eighteenth century.